When does Rank Magic report on your keyword status? Once the keyword identification, prioritization and selection process has been completed and you’ve selected the essential keywords for your web site, Rank Magic provides a report of your initial search engine rankings. These are your search engine rankings before any changes have been made to your web site, and they act as a baseline. The only difference between the format of this report and all of the others is that there are no prior results to compare with on this report so there is no trend to display. Thereafter, your report is updated monthly, and we send it to you along with lots of additional information about your online authority, traffic, and comparisons to your top thee competitors. This continues for the life of your SEO project. 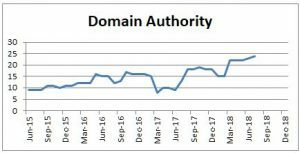 Since your link popularity and domain authority are so critical to your rankings, we report separately on our efforts to improve that, and track our progress graphically. 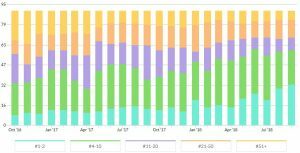 We report monthly on how your link popularity compares to a half dozen or so of your top competitors on four critical metrics. While search engine rankings are often persistent over many months or years, they can be subject to change. The algorithms used to rank web sites change all the time. And new competitors may emerge that also can affect your positioning. As a result, we recommend that you keep an eye on your hard won web site rankings with a monitoring program that continues these monthly reports. Of course the reason we care about rankings is that they drive visitors to your website. Our monthly reports include data from your Google Analytics and report to you monthly about your website traffic. That’s the bottom line proof that your SEO is really sending more potential customers to your website. Contact Rank Magic today to get get great search engine rankings! Better web site ranking will result in more business from your web site!